Jose Gonzalez is talking to the crowd. He’s funny and entertaining and obviously at ease. As a fan of the Swedish singer-songwriter, who has seen him in concert a few times, I ask myself, “Is this the same artist who performs in monosyllables to solemn, packed houses?” I wonder, “Is it his new look?” His hair has undergone a dramatic change that makes him look all the more Argentine. For reasons beyond his long curls, I decide that it’s Argentina making the difference for this Swede of Mendoza heritage. In 1976, Jose Gonzalez’s politically active parents fled an Argentina on the brink of brutality. They were offered asylum in Sweden. Tonight, Jose Gonzalez is at La Trastienda and though his catalogue of songs is totally in English, his banter is the pure Castellano of his parents’ native country. Suddenly, he’s witty and self-assured, not only during his catalogue – that is unusually rich for a relatively new singer songwriter – but between his amazing songs as well. I’m seeing a more open side of Jose Gonzalez, making me think that maybe he just doesn’t let his hair out down in English? Gonzalez is touring to support his second release, In Our Nature. His debut, Veneer, subtly altered the acoustic pop landscape with its powerful, James Taylor-esque, wave of message-embedded-in-melody. 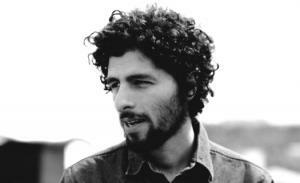 In his way, Jose Gonzalez is a self-contained, global, warrior for peace. He plays his simple songs and stops time for a moment. Well, that’s what he did at La Trastienda this week in Buenos Aires. His voice, his rhythmic guitar, his buena onda was contagious and thick with purpose. Luckily, he was lighthearted in Spanish and managed to clear the air with a few words between songs. Three years ago, Jose Gonzalez debuted Veneer in New York City at Joe’s Pub downtown. I’d memorized the record and looked forward to seeing him live, but he was stoic and stilted and it was one of those “no breathing allowed” kind of rooms. So I held my breath and got pretty bored as the show wore on. I heard snoring behind me and, surpressing a snicker, looked over my shoulder only to see Lou Reed from the Velvet Undergroud, classic piece of rock history that he is, dead asleep and possibly drooling into his cupped hand that supported his sleeping face. That woke me up and kept me entertained until the end of the show. I kept looking back and there was Lou, knocked out. The show ended and he woke up. I asked him how he’d enjoyed Jose’s show. “It was great,” he said. It had been a very mellow show. I bet Veneer made for nice dreams. When Veneer had its US release, there was a retrospect of Norwegian artist Edvard Munch showing at the Museum of Modern Art in New York City. Veneer was on my Ipod when I attended the show and I listened as I looked. Somehow, the expressionist painter and printer, most famous for “The Scream,” was well served by a Jose Gonzalez soundtrack, and the two Nordic artists synchronized perfectly. 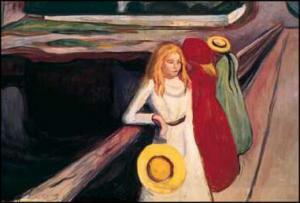 I’ll forever see Munch’s haunting paintings when I hear a song from Veneer. From his introverted style of presentation and the themes found in his music, I likened Jose Gonzalez to my impression of Munch. I believe Jose wouldn’t mind – he’s quite Scandinavian and all artist. 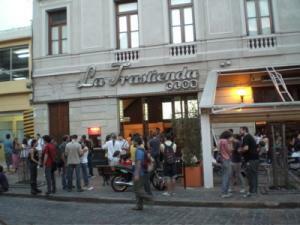 But here in Argentina last week, the audience saw a warmer, more approachable side. He was his parents’ child – the Jose that may have grown up here, had there not been dictators and desaparacidos. Smiling and in his element at La Trastienda, his rhythmic guitar and sweet vocals graced us with his songbook – that of a Swede named Gonzalez, on tour in Buenos Aires. This page rendered in 0.403 seconds.